Minneapolis, Champlin, Forest Lake Area Schools, Lester Prairie, Dakota County, Waconia Public Schools. What do these local governments and schools districts have in common? They are just a sample of public entities that have utilized third-party financing as a means to place solar arrays on their facilities. Third-party financing is an innovative tool for public entities to tap into long-term energy cost savings without requiring large up-front capital expenditures. Local governments and schools are great locations for solar: large, flat roofs, lots of expensive electrical load, a commitment to sustainability, and a guarantee that they’ll never go out of business. However, since governments can’t take advantage of federal tax credits for solar, the projects often don’t pencil out financially. Third-party financing is a popular means to overcome this barrier. It occurs in two forms: solar leases and power purchase agreements (PPAs). In the lease model, a customer pays a fixed amount over a set period of time. In the PPA model, the customer pays a fixed price per kWh for power generated. The kWh rate is typically lower than the local utility rate. In both cases, the third-party company owns, operates, and maintains the solar array and can tap into tax benefits not available to the public sector. Another barrier is the complex nature of long term utility contracts. Local government and school officials are being asked to review proposals that are not apples-to-apples comparisons. Proposals can vary in array size and location, PPA rate and term, technologies utilized, and more. With this in mind, CERTs collaborated with the City of Woodbury and KFI Engineering to develop a model Request for Proposals (RFP) that will enable local governments and school districts to more easily compare proposals. 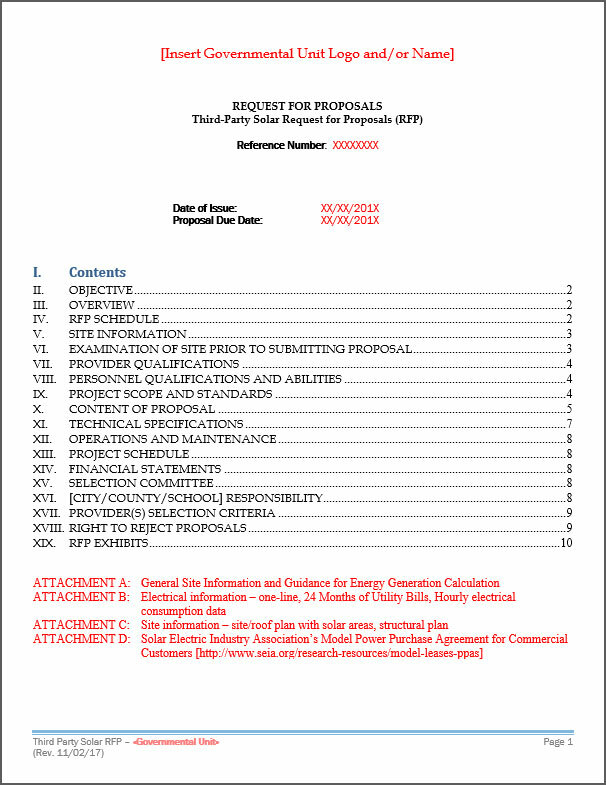 The model RFP contains traditional RFP language about the responders experience, qualifications, project scope, and schedule while also providing a comprehensive overview of technical specifications, site utility use, energy generation estimates, and more. Spreading the Word: A component to any successful RFP is to widely disperse the document. CERTs can assist in this effort by distributing the RFP to solar companies participating in the Clean Energy Project Builder. Questions? If your public entity has questions about solar or would like support on your efforts, please contact me, Peter Lindstrom, CERTs Local Government Outreach Coordinator, at 612-625-9634 or plindstr@umn.edu.